Odour exposure criteria have evolved as a statistical means of associating odour emissions from a source with the impact (air-borne concentration) at ground level, in terms of probability of occurrence. The criteria are probability-based and therefore are not absolute ‘limits’. Strictly speaking the criteria are based upon ‘average concentrations’ that are likely to occur for a specified percentage of the time over a year. Ambient odour problems are most likely to arise in adverse meteorological conditions (e,g., temperature inversions, low wind speeds etc.) when relatively little dilution arises. For this reason, most computer dispersion modelling will incorporate a minimum of 3-years’ met data sourced from a local station. In essence, odour impact assessment utilises odour source concentrations, ventilation rates and emission strength (odour emission rates), topographical information together with meteorological data and air dispersion software to model odour dispersion circa the source. Distance from centre of WWTP site in metres. 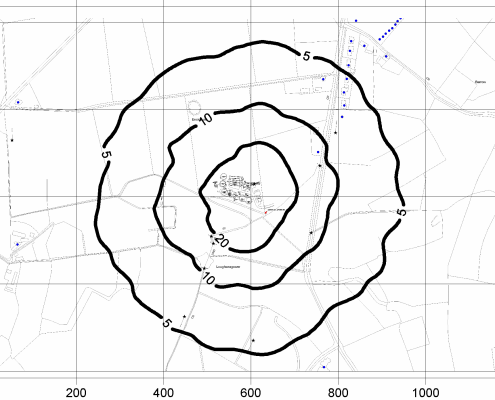 Odour impact areas can be defined by plotting isopleths of odour concentration corresponding to selected values for odour impact criteria, and/or ground level concentrations (GLCs) can be predicted at specific locations (e.g. site boundaries or neighbouring properties, as shown in Figure A). According to Yang and Hobson (2002) a quantitative approach is necessary for odour control because a rational and consistent means is needed for the justification, evaluation and specification of solutions for preventing and reducing odour nuisance. Thus, predicted GLCs can be assessed with reference to odour criteria which are typically expressed in terms of percentile values.